College is often described to be the best years of one’s life – the last stretch of relatively carefree existence before plunging head-first into the real world, the time for experiencing lots of new things without too many responsibilities. Everything following it is going to be drab by comparison. But doesn’t this way of thinking set one up for disappointment? Although having successfully graduated from college may seem like an achievement to be proud of, statistics show that with many former students pretty much the opposite is true. 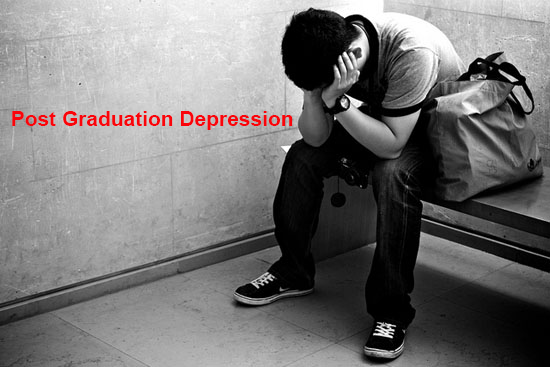 Post-graduation depression is a very real thing that can creep up even upon those normally unaffected by mental health issues. So what are the signs? How do you figure out you are going through a post-graduation depression and not just feeling a bit down at the moment? Do you feel like you’ve been emptied out until there is absolutely nothing left and you are just a sack of skin with a void inside? Do you have to apply disproportionate effort to perform even the most mundane tasks? Do you think “What’s the point?” when it is time to get out of bed in the morning? Do you continually make excuses not to do something you know is good for you (like job hunting or sticking to your workout plan)? If the answer to any or all of these questions is “yes,” then most likely depression it is. It is especially true when it comes to your career because it is where new graduates feel particularly vulnerable. If you still cannot find a job, you are down because you feel worthless and start thinking that the time spent getting a college education was wasted in vain. Why did you even write all these papers if you could have just as easily bought them from cheapessay.net? If you’ve landed a job you don’t like (or where you are underpaid), you may lack the motivation to put serious effort into it or into improving yourself so that you can find something better. Thus, you risk getting into a vicious circle: your job (or lack thereof) makes you feel demotivated, but motivation is exactly what you need to get out of this situation. One of the common signs of depression is the wish to hide inside the boundaries of well-known experiences and seal yourself from anything even remotely new. Unfamiliar experiences are perceived as threatening and unpredictable, and a person in depression feels too threatened already to subject himself to anything above and beyond what he already experiences. This again demonstrates how depression feeds itself – when you are stuck you have to experience something new, to leave your comfort zone if you want to get better, but depression deprives you of the will to do so and even forces you to actively avoid untried experiences. This unwillingness may exist on any level – from the reluctance to go to the job interview to something ridiculous, like the unwillingness to try new food. The same goes for pleasure. If activities that you once perceived as pleasant started to bore and annoy you, if you no longer enjoy communicating with your friends, if things that normally made you excited fail to provoke any response, chances are you suffer from depression. You may feel that even with your favorite activities you are just going through the motions without any meaning behind them. You may lose all desire to partake of them at all. At such moments, it is useful to remember that depression makes your self-starting mechanism go awry. This doesn’t, however, mean that you cannot derive any pleasure from any activity at all. Sometimes, if you persuade yourself to start an activity, you will manage to get into it and feel interested and enthusiastic, at least for a while – and when you suffer from depression, even a small respite from it is worth a lot. For example, if you like writing you may simply open a list of expository essay topics and find it in yourself to write about them, one at a time. Having to meet deadlines and stick to the timetable in college hay have felt annoying, but it did one important thing: it gave form to your life. Much of what you did was decided for you. You had to stick to your timetable because you had a specific amount of work to do by specific points in time. Now you are completely on your own, and all planning that you do or do not do is your own responsibility. Nobody is going to tell you what to do; it is up to you to choose the direction in which you are going to move. Needless to say, it may feel disorienting and more than a little bit scary. To deal with chaos, start using to-do lists or other planning tools. By setting small, achievable goals, you will bring the organization back into your life. Post-graduation depression is particularly dangerous for those who had a great college experience. If you cannot find a job for a long time or don’t move forward with your projects, it may seem that your life isn’t going anywhere, which colors all other aspects of it grey. However, it is important to remember that all things pass – and if you keep going and looking for things to look forward to, your current state will improve too.